Measurements of various quantities are relative to the velocities of observers. In particular, space and time can dilate. Spacetime: space and time should be considered together and in relation to each other. The speed of light is nonetheless invariant, the same for all observers. The theory of relativity transformed theoretical physics and astronomy during the 20th century. When first published, relativity superseded a 200-year-old theory of mechanicscreated primarily by Isaac Newton. In the field of physics, relativity catalyzed and added an essential depth of knowledge to the science of elementary particles and their fundamental interactions, along with ushering in the nuclear age. With relativity, cosmology and astrophysics predicted extraordinary astronomical phenomena such as neutron stars, black holes, and gravitational waves. Finally, the mathematics of general relativity appeared to be very difficult. Consequently, it was thought that a small number of people in the world, at that time, could fully understand the theory in detail, but this has been discredited by Richard Feynman. Then, at around 1960 a critical resurgence in interest occurred which has resulted in making general relativity central to physics and astronomy. New mathematical techniques applicable to the study of general relativity substantially streamlined calculations. From this, physically discernible concepts were isolated from the mathematical complexity. Also, the discovery of exotic astronomical phenomena in which general relativity was crucially relevant, helped to catalyze this resurgence. The astronomical phenomena included quasars (1963), the 3-kelvin microwave background radiation (1965), pulsars (1967), and the discovery of the first black hole candidates (1981). Einstein stated that the theory of relativity belongs to a class of “principle-theories”. As such it employs an analytic method. This means that the elements which comprise this theory are not based on hypothesis but on empirical discovery. The empirical discovery leads to understanding the general characteristics of natural processes. Mathematical models are then developed which separate the natural processes into theoretical-mathematical descriptions. Therefore, by analytical means the necessary conditions that have to be satisfied are deduced. Separate events must satisfy these conditions. Experience should then match the conclusions. The defining feature of special relativity is the replacement of the Galilean transformations of classical mechanics by the Lorentz transformations. (See Maxwell’s equations ofelectromagnetism). General relativity is a theory of gravitation developed by Einstein in the years 1907–1915. The development of general relativity began with the equivalence principle, under which the states of accelerated motion and being at rest in a gravitational field (for example when standing on the surface of the Earth) are physically identical. The upshot of this is that free fall is inertial motion: an object in free fall is falling because that is how objects move when there is no force being exerted on them, instead of this being due to the force of gravityas is the case in classical mechanics. This is incompatible with classical mechanics and special relativity because in those theories inertially moving objects cannot accelerate with respect to each other, but objects in free fall do so. To resolve this difficulty Einstein first proposed that spacetime is curved. In 1915, he devised the Einstein field equationswhich relate the curvature of spacetime with the mass, energy, and momentum within it. Clocks run more slowly in deeper gravitational wells. This is called gravitational time dilation. Orbits precess in a way unexpected in Newton’s theory of gravity. (This has been observed in the orbit of Mercury and in binary pulsars). Rotating masses “drag along” the spacetime around them; a phenomenon termed “frame-dragging”. Maxwell’s equations – the foundation of classical electromagnetism – describe light as a wave which moves with a characteristic velocity. The modern view is that light needs no medium of transmission, but Maxwell and his contemporaries were convinced that light waves were propagated in a medium, analogous to sound propagating in air, and ripples propagating on the surface of a pond. This hypothetical medium was called the luminiferous aether, at rest relative to the “fixed stars” and through which the Earth moves. Fresnel’s partial ether dragging hypothesis ruled out the measurement of first-order (v/c) effects, and although observations of second-order effects (vv/cc) were possible in principle, Maxwell thought they were too small to be detected with then-current technology. The Michelson–Morley experiment was designed to detect second order effects of the “aether wind” – the motion of the aether relative to the earth. Michelson designed an instrument called the Michelson interferometer to accomplish this. The apparatus was more than accurate enough to detect the expected effects, but he obtained a null result when the first experiment was conducted in 1881, and again in 1887. Although the failure to detect an aether wind was a disappointment, the results were accepted by the scientific community. In an attempt to salvage the aether paradigm, Fitzgerald and Lorentz independently created an ad hoc hypothesis in which the length of material bodies changes according to their motion through the aether. This was the origin of Fitzgerald-Lorentz contraction, and their hypothesis had no theoretical basis. 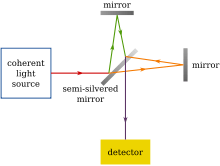 The interpretation of the null result of the Michelson–Morley experiment is that the round-trip travel time for light is isotropic (independent of direction), but the result alone is not enough to discount the theory of the aether or validate the predictions of special relativity. 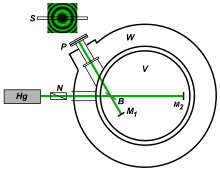 While the Michelson–Morley experiment showed that the velocity of light is isotropic, it said nothing about how the magnitude of the velocity changed (if at all) in different inertial frames. The Kennedy–Thorndike experiment was designed to do that, and was first performed in 1932 by Roy Kennedy and Edward Thorndike. They obtained a null result, and concluded that “there is no effect … unless the velocity of the solar system in space is no more than about half that of the earth in its orbit”. That possibility was thought to be too coincidental to provide an acceptable explanation, so from the null result of their experiment it was concluded that the round-trip time for light is the same in all inertial reference frames. General relativity has also been confirmed many times, the classic experiments being the perihelion precession of Mercury’s orbit, the deflection of light by the Sun, and thegravitational redshift of light. Other tests confirmed the equivalence principle and frame dragging. The history of special relativity consists of many theoretical results and empirical findings obtained by Albert Michelson, Hendrik Lorentz, Henri Poincaré and others. It culminated in the theory of special relativity proposed by Albert Einstein, and subsequent work of Max Planck, Hermann Minkowski and others. The theory of Relativity is used in many of our modern electronics such as the Global Positioning System (GPS). GPS systems are made up of three components, the control component, the space component, and the user component. The space component consists of satellites that are placed in specific orbits. The control component consists of a station in which all of the data from the space component is sent to. Many relativistic effects occur in GPS systems. Since each of the components is in different reference frames, all of the relativistic effects need to be accounted for so that the GPS works with precision. The clocks used in the GPS systems need to be synchronized.). In GPS systems, the gravitational field of the earth has to be accounted for. There are relativistic effects within the satellite that is in space that need to be accounted for too. GPS systems work with such precision because of the Theory of Relativity. Einstein’s contemporaries did not all accept his new theories at once. However, the theory of relativity is now considered as a cornerstone of modern physics, see Criticism of relativity theory. Although it is widely acknowledged that Einstein was the creator of relativity in its modern understanding, some believe that others deserve credit for it, see Relativity priority dispute. Thanks so much for following sciencesprings. I really appreciate it.